Home » News » Oblivitron & Lazul’s Scheme Have Been Revealed from the Hearthstone Rise of Shadow Set! Oblivitron & Lazul’s Scheme Have Been Revealed from the Hearthstone Rise of Shadow Set! Two new cards from the Hearthstone Rise of Shadows expansion have been revealed. The first is a Hunter Legendary called Oblivitron, and the second a Priest Epic called Lazul's Scheme! 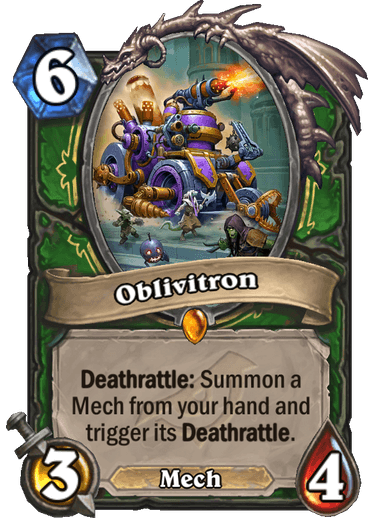 Oblivitron is an interesting addition to Hunter that potentially pushes it back towards being a Mech class. The problem for this card is that there isn't a whole lot of Mechs in Standard available at the moment. This card has a lot more potential to be abused in Wild, where there's still a stronge base of Mechs. We'll see if Blizzard supports a more Mech based archetype for Hunter as more cards are revealed. 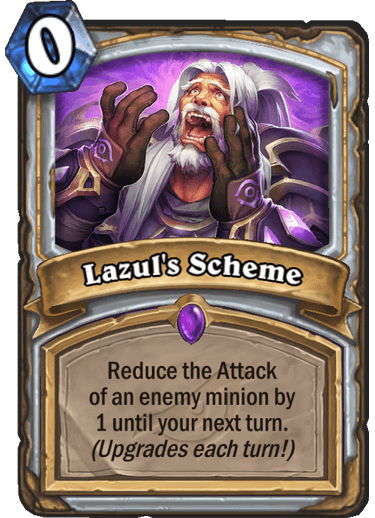 Lazul's Scheme is an interesting card, it pairs well with some of Priest's old school removal. The 0-cost on the card is very solid, and the fact that it reduces the attack until YOUR next turn means that your opponent likely won't be able to attack with it! Learn more about the expansion with our guide, and check out all of the other revealed cards here.